Please take a look at the new Butterfly Photo Gallery we have just added to this website by clicking here. We hope this new feature will interest you as much as it does us! The species shown are all commonly seen here in the Coto Brus region and can be found near your house (or sometimes in it! ), by the roadside, in gardens and often on bird walks. They are every bit as fascinating and beautiful as birds, with complicated life cycles that, for some species, even include migrations. 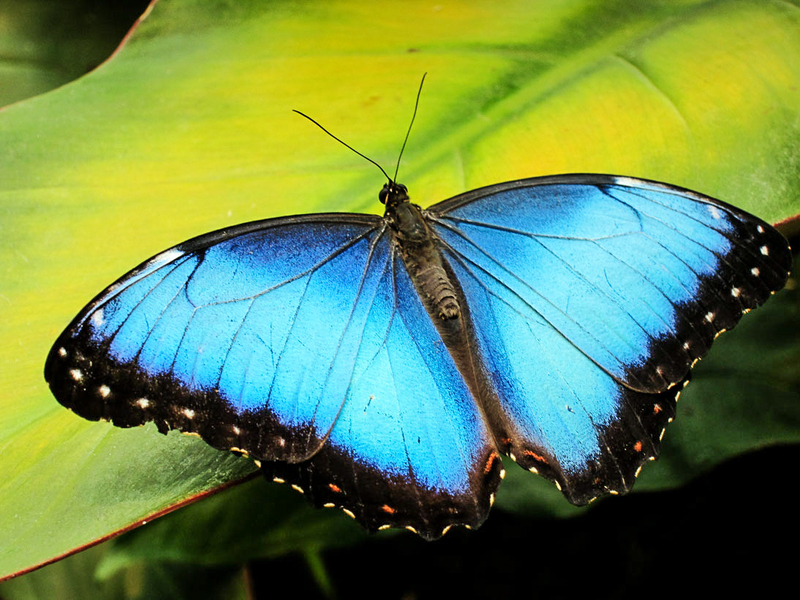 You may notice we have omitted the iconic butterfly of the tropics: the omnipresent Morpho. Here is one of those so you won’t feel bereft. Blue Morpho. Photo by unknown photographer, posted on www.mini-life.com. In the not too distant future, we plan to add another photo gallery — this one of moths — to complete the other half of the order Lepidoptera as well as broaden the scope of our website. We will post an announcement of this feature as soon as it is published. This entry was posted in Website news and tagged Morpho Butterfly by AWOlivieri. Bookmark the permalink.